Nuraghe Piscu is a site of great archaeological and historical significance. It is a popular tourist destination and draws large crowds of history fanatics on a regular basis. One of the best preserved nuragic complexes in the world, this place is home to a tholos-style main tower which is 9.10 meters tall. In addition to this, this place has the ruins of a bastion of 34 x 33 meters dimensions with three side towers. What remains of the ancient nuragic village can also be seen here. The towers is in great condition, and defies its age. Visit this site for an enlightening, historic experience. Make your visit suitable to your interest, use Cagliari trip planner for personalization. Your worry of where to stay in Cagliari is sufficed by bunch of interesting and comfortable lodging options in the Cagliari like Hotel L' Ambasciata, Hotel Dedoni and Maison Miramare Boutique Hotel. If you want to add the visit to Nuraghe Piscu in your trip, you can choose from the variety of Cagliari vacation packages that can be designed to suit your preferences. These packages also cover your major concern of how to reach Cagliari. Love this? Explore the entire list of places to visit in Cagliari before you plan your trip. Fancy a good night's sleep after a tiring day? Check out where to stay in Cagliari and book an accommodation of your choice. 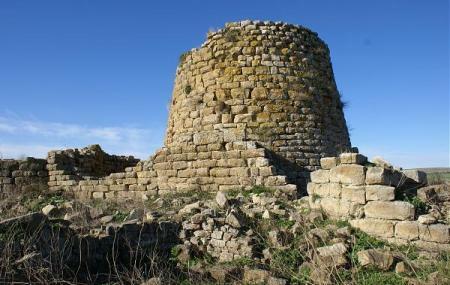 Nuraghe complesso, molto bello e ben conservato. Peccato non sfruttarne le potenzialità. Nuraghe complesso molto interessante, di facile accessibilità con molti paramenti murari in buone condizioni. L'intorno e l'area di accesso al nuraghe avrebbe necessità di manutenzione per valorizzare al meglio la struttura. Da visitare. Come tutti i nuraghi in buono stato bello affascinante e carico di storia.